If you had told me I would get hooked on kettlebell workouts, I probably would have laughed at you. I thought they were just for big strong men, like my husband. Now, I would not want to be without them. They were new to me, several years ago. My husband started reading about them around ten years ago. Then he purchased some kettlebells, and a couple of kettlebell workout DVDs. He seemed to like using them, but the weight of the kettlebells, and the way the swung them so quickly, well, it all kind of scared me. He did some of his first workouts in the backyard. This was a good thing, as he kind of “overdid it” and lost his grip on them one or two times. This scared me. He kept at it, though, and never dropped them inside our house. He kept encouraging me to try kettlebells, but we both knew his kettlebells were way too heavy for me. I was unsure I wanted to invest in something like a kettlebell, or set of them, but for some strange reason (growing tired of his invitations, maybe?) I became interested in getting one and finally tried it. I was very concerned that I would let go of the kettlebells during workouts, but this has never happened. I also have had lower back problems, and an old shoulder injury, and thought that I could become a victim of kettlebell injuries, but this has not happened, not at all. If anything, it has helped keep me free from pain in my back and shoulder. Kettlebells provide me with just the right exercise for lower back pain. What has happened is that I have had astonishing results in a much shorter time than I have had with any other weight workout. Noticeable, quick improvements in my strength, cardiovascular endurance, and appearance. I believe that you will keep hearing more and more about this up and coming form of workout as time goes on. Kettlebell history is being made here in the United States, and I believe that kettlebells are here to stay! How strongly do I believe this? Well, last summer I sold my entire set of dumbells that were cluttering up my house. I have had these dumbells for many, many years, and used them for many of what were my much-loved workouts. But I have no regrets about selling them. 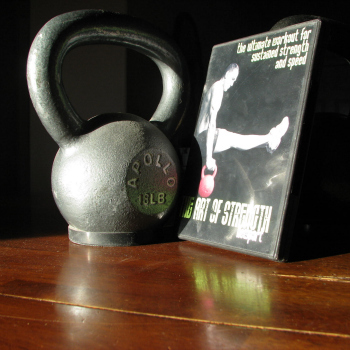 Kettlebell equipment takes up far less space than conventional free weight equipment. No weight bench is needed (I sold that last summer, too ;-). Kettlebells do more for me in less space and time than dumbells ever did. 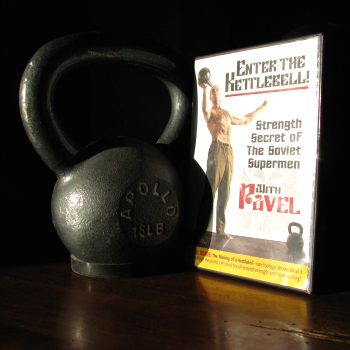 My kettlebell workouts began with the purchase of an 18 lb kettlebell, which is the recommended weight for an average woman, and the DVD “Newport” by Art of Strength. I think the woman from the sporting goods store must have suggested “Newport” because it did not require two kettlebells, only one. So my dear husband ran over an hour across town for me, picked up my new kettlebell and workout DVD. 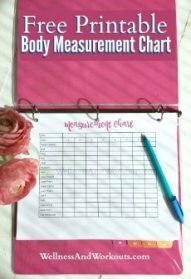 I tried “Newport” soon after, and laughed quite hard, because I knew I was NOT going to master this workout any time soon! 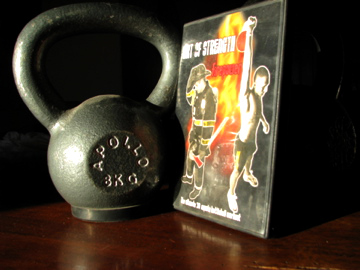 Next I tried my husband’s “Firepower” kettlebell DVD. This requires two kettlebells of equal weights, but since I was such a rank beginner, I made due with just one. Before I knew it, dear husband was traveling across town again to get me another kettlebell. I was hooked. Give kettlebells a try, and you might be, too!